Tyndall landed at the University of Marburg, where he studied under, amongst other people, Robert Bunsen, of Bunsen Burner fame. During his time in Germany, he became adept at experimental and laboratory procedures in a number of different scientific disciplines. If there was one scientist in Britain who appreciated experimental technique, it was the great Michael Faraday, who had risen from humble beginnings on the strength of his ability to discover important scientific principles from deceptively simple experimental apparatus. As the Director of the Royal Institution, Faraday was in a prime position to notice talented young scientists, and Tyndall soon caught his eye. Impressed by both his laboratory and lecturing abilities, Faraday offered Tyndall the position of Professor of Natural Philosophy at the Royal Institution. Indeed, Tyndall stayed at the Royal Institution for the rest of his professional life, eventually filling the very large shoes of Michael Faraday as Director. Very generally, most of his scientific work involved the interaction of light and matter. He performed much work using infrared light, and measured the extent to which each gas in the atmosphere absorbs infrared, concluding that water vapor absorbed the most. Thus, he was the first to demonstrate the Greenhouse Effect, although it had been previously theorized. In performing these experiments, he noticed that the effect of particulates (dust, pollen, etc.) in his optical cells greatly affected the accuracy of the measurements. Making an opportunity out of an experimental problem, he realized that the size of the particle greatly affected the amount to which his light beams were scattered away from their proper direction. He also determined that the amount of light that was scattered depended on its color with blue light scattering more than red. This explanation was expanded upon by Lord Rayleigh who discovered that scattering could be caused by particles as small as molecules. Thus, the molecules of the atmosphere (mostly nitrogen and oxygen) scatter blue light more than red, so that the blue light appears to come from all across the daylit sky. When the sun is near the horizon at sunrise and sunset, its light must pass through a longer distance of atmosphere so that the blue light is scattered completely away, leaving the orange-red color typically seen at those times. Remember the next time you’re asked—The sky is blue because the blue light from the sun is scattered more than the other colors. An interesting aside here—as Tyndall’s experiments were adversely affected by particles in his optics, he devised methods of removing them by letting them settle out and entrapping them in an adhesive material. He discovered that if he put sterilized broth into contact with this “optically pure air” that the broth did not become putrid. He correctly surmised that some of the particles must be “germs”, thus providing additional experimental evidence for Louis Pasteur’s theories. 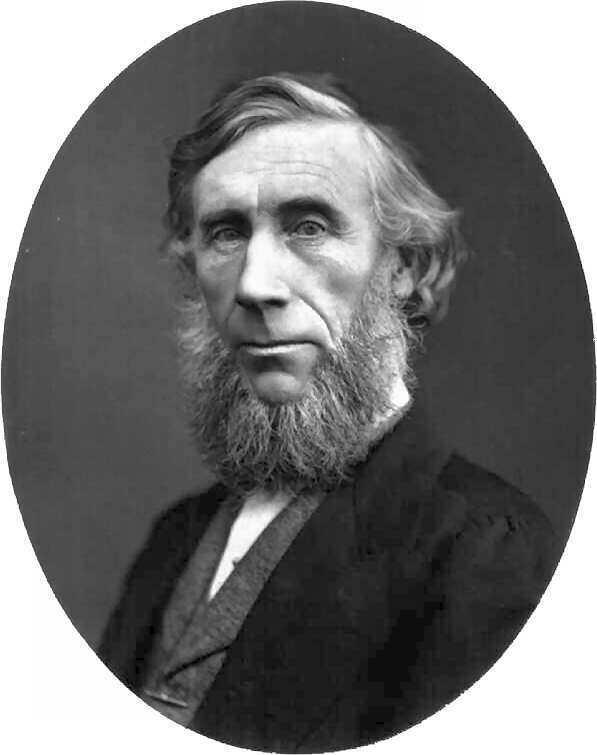 John Tyndall was not content with purely laboratory work, however. He became one of the pioneering “alpinists”, as mountain climbers were called in the Victorian times. He routinely left England each summer for the Alps, and participated on noted ascents of several alpine peaks. While in the mountains, he studied glaciers and contributed to the understanding of glacial movement. 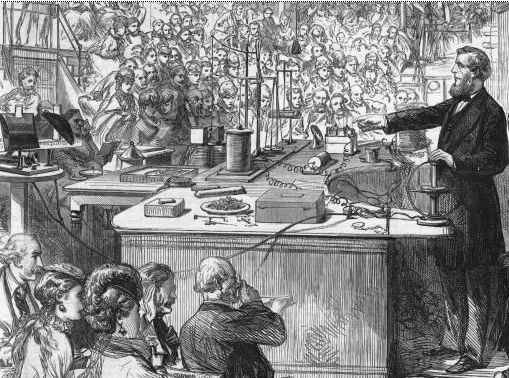 Tyndall was also a noted and entertaining lecturer and took over for Michael Faraday in presenting the annual Christmas Lectures at the Royal Institute aimed at describing science for young people. He took on a lecture tour of America in 1872 which was so successful that he used the proceeds to endow scholarships at Harvard, Columbia, and the University of Pennsylvania in gratitude. Tyndall presenting one of the Royal Institution’s Christmas Lectures. And apparently he was also a poet, lending the sensibility of the romantic poets to scientific observation. His poem “A Morning on Alp Lugsen” touches upon cosmology, molecular spectroscopy, and organic chemistry. Tyndall married only late in life, at age 55, but it doesn’t seem that it was for lack of trying; at least two prior marriage proposals were refused by their intended targets. He lived his bachelor days (and in fact, for several years after marriage) in a small apartment upstairs at the Royal Institution, mimicking his patron Faraday. He died in 1893 at age 73 after an accidental overdose of chloral hydrate by his young wife. She went on to outlive him for 47 years. A large portion of the novel I am writing, a prequel to To Rule the Skies, takes place at the Royal Institution. Given that they lived under the same roof, Tyndall seems to be one of the very few people that the Faradays socialized with (as Professor Faraday preferred spending the time working). So, it is only natural that John Tyndall makes some cameo appearances in the novel. This entry was posted in Science and tagged science, Tyndall, Victorian by mjtierney1. Bookmark the permalink.